50 ton gantry crane is an ideal lifting solution for handling large and heavy materials up to 50 ton. 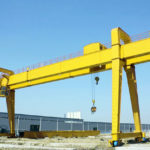 It belongs to a heavy duty gantry crane and usually comes in double girder design. 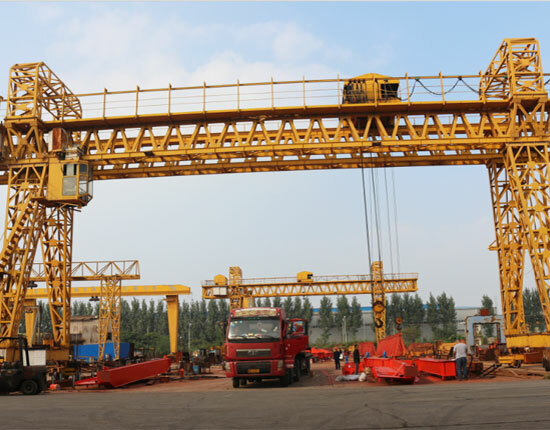 The gantry crane 50 ton is widely applied in many industries, such as shipyard, railway, ship to shore, mining and manufacturing industry to lift and move bulky loads. 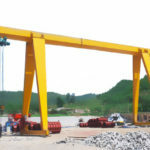 The 50 ton gantry cranes produced by Ellsen can be found in many different types to suit a wide range of applications, mainly including rail mounted gantry crane, rubber tyred gantry crane, portable gantry crane, and container gantry crane. Each crane 50 ton is designed for specific purpose, from which you can find one that is right for you. Besides 50 ton gantry crane, we supply other types of heavy duty gantry crane, such as 30 ton, 40 ton, and 100 ton gantry crane to serve your heavy lifting needs. Small gantry cranes are also designed to meet your various requirements. We have various types of 50 ton gantry cranes for sale. They are designed into a wide range of sizes and forms to serve different uses. A full understanding of these different types can help you choose the most suitable equipment. 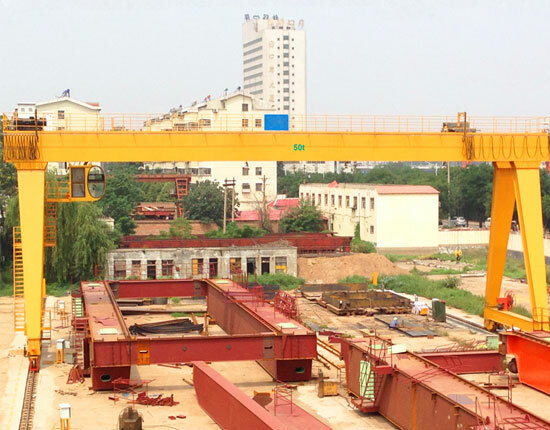 As a regular crane, MG double girder crane is the most commonly used lifting equipment in outdoor places such as freight yards, construction site, and rail terminals. 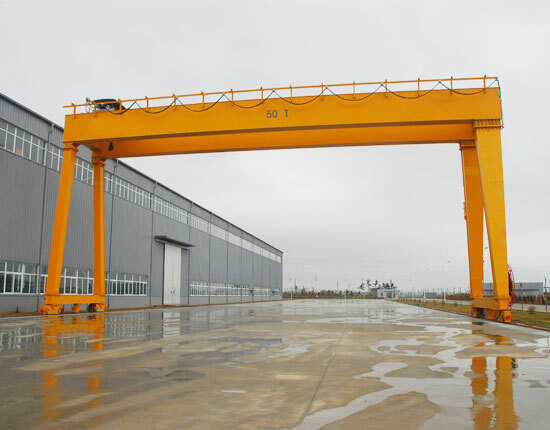 In terms of the shape of metal structure, it is a typical A frame gantry crane. This 50 ton gantry crane mainly consists of main beam, supporting legs, hoist trolley, end carriages, and electric control system. The gantry lifting equipment is normally powered by cable drum, diesel generator or bare copper wires. The supporting legs are attached to end carriages which are mounted on rails to drive the equipment to move. This gantry crane is available in various forms such as box and truss structure, cantilever design and saddle options. Besides, you can choose semi gantry crane according to your actual working environment. 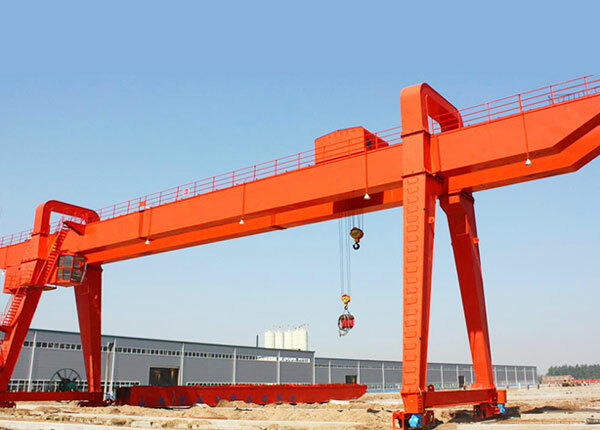 The name of U frame gantry crane comes from U-shape legs viewed from both sides of the crane. Compared with A frame crane, this equipment provides larger space between the two legs, making it perfect to handle bulky and large sized items such as containers. 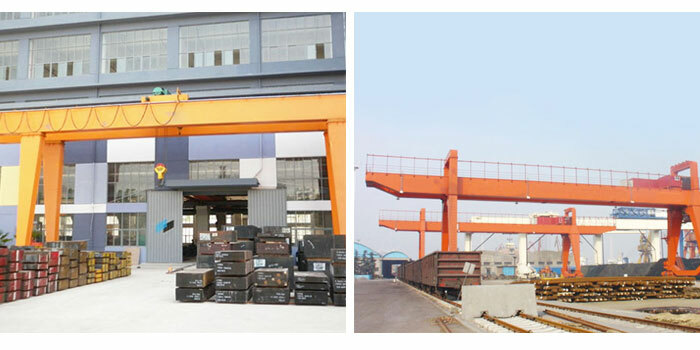 The 50 ton gantry crane is widely used in open freight yards and railway. You can choose this type of crane 50 ton based on the materials to be handled. Rubber tyred gantry crane provides a mobile lifting system to meet heavy lifting requirements. Attached to rubber tires at the bottom, the 50 ton mobile gantry crane does not require a fixed path and can travel anywhere within the working area freely. It can also move from place to place easily to achieve a high utilization. The portable gantry crane 50 ton is widely applied in ports and container terminals to realize a flexible lifting movement. Container gantry crane is specially designed to handled stack of containers in port, quay and railway. This 50 ton gantry crane is available in different types, such as rail mounted, rubber tyred and ship to shore gantry crane. 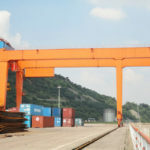 To meet loading, unloading and transferring needs at container terminals, the gantry container crane usually has high working level, large span and height. The gantry crane span is determined by the rows of containers to be lifted across the equipment. How Can 50 Ton Gantry Crane Help Improve Efficiency? As a highly efficient lifting tool applied in many fields, 50 ton gantry crane helps promote production in many aspects. 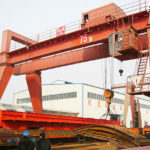 The gantry crane can significantly reduce labor cost and save time. This heavy duty gantry crane is capable of carrying out massive heavy lifting work at a time, and can be used Besides, the operation of this heavy duty crane only involves a few workers. It can be operated either within a cab or through a wireless remote control. Or you can choose the combination of these two methods. The 50 ton gantry crane is fabricated with solid structure. By adopting advanced design concepts and quality components, our gantry cranes have superior quality and prolonged life of work. The durable performance allows it to bring high productivity to your business. This large gantry crane can be equipped with anti-swaying device and anti-collision device so as to facilitate a more stable and efficient operation as well as accurate positioning. The excellent gantry lifting system can help reduce downtime and require less maintenance. 50 ton gantry crane provides a much safer lifting and moving of heavy loads. Various safety devices are equipped to ensure a secure operation and prevent accidents. The heavy duty gantry crane can realize a maximum coverage of working areas so as to make a high utilization. It is adaptable for a large variety of workplaces, making it an economical lifting solution. Whether an A frame, U frame or portable designs, the 50 ton gantry cranes are popular lifting solutions for large and heavy loads. We can provide 50 ton crane with different sizes, specifications and configurations to meet your precise requirements. We are leading gantry lifting equipment manufacturer in China and aim to design solutions to serve a wide range of lifting needs. According to your practical applications and working environments, we can design the gantry crane to any height and span. The heavy duty crane can reach a larger lifting capacity, such as 100 ton, 200 ton and 300 ton. In terms of portability, you can choose either a rail mounted type or mobile one. The mobile gantry crane can be equipped with tired wheels or caster wheels according to different lifting needs. In addition, with regard to different lifting capacities, we design different operation control systems, such as manual and electric operations. For some vital components, we provide various options to suit different occasions. For instance, spreaders such as hook, grab and magnetic chuck are applied to handle different materials. We provide electric chain hoist, wire rope hoist and European standard hoist according to your actual applications. Our gantry crane is suitable for many different environments, such as indoor, outdoor, hazardous environment, and marine. Some designs above are only available for certain equipment. 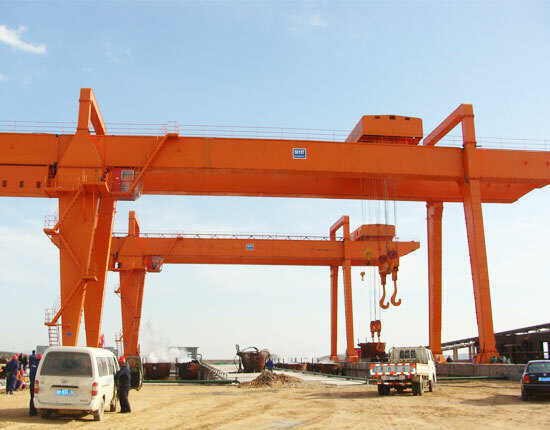 If you want to know your 50 ton gantry crane design, please contact us online. We will customize the solution for your individual application. We supply many different types of 50 ton gantry crane to meet diverse lifting needs. 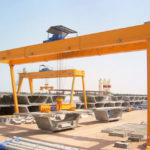 When selecting a gantry lifting system 50 ton, it is vital for you to determine the configuration, size, form, application and working environment of your gantry crane lifting equipment. A right lifting solution can not only help elevate efficiency, but lower energy consumption and save money for you. 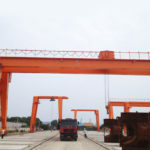 If you want to buy a gantry crane 50 ton, you can choose Ellsen gantry crane. 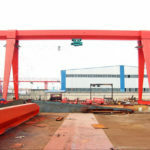 We have accumulated a wealth of experience in designing and manufacturing material handling equipment including overhead crane, gantry crane, jib crane, electric hoist, construction winch and marine winch. Many of our products have been exported to over 80 countries and regions, winning good reputation among clients. We provide a full spectrum of services encompassing design, fabricating, package, shipping, installation and maintenance so as to simplify the order process of customers and save time and money for them. With regard to different applications and working conditions, we can help choose the most appropriate material handling system and offer a factory price. If you are unsure as to which size and form of 50 ton gantry crane is suitable for your application, please feel free to contact our sales representatives online directly. We are willing to design the best gantry lifting solution to suit your most practical needs.